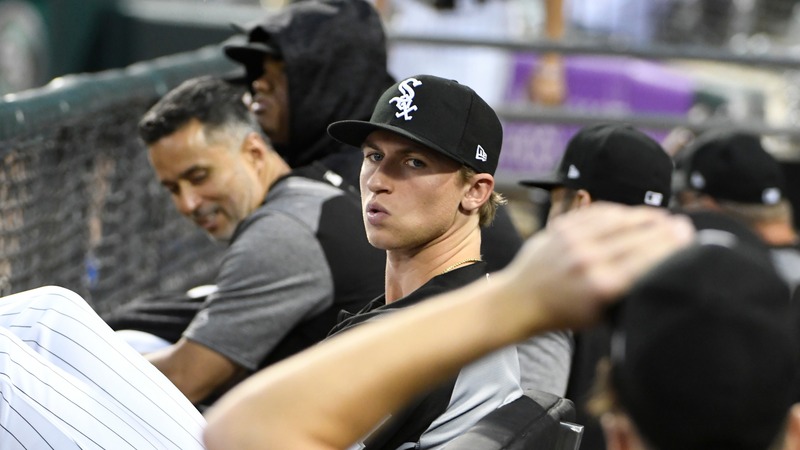 With Michael Kopech underdoing Tommy John surgery, we look at similar cases to see what could be next for the White Sox young pitcher. White Sox fans waited patiently for the arrival of hard-throwing pitching phenom Michael Kopech, and on August 21 they were rewarded. The 22-year-old made his major league debut against the the Minnesota Twins, throwing three innings in a rain-shortened performance. Over his first three big league starts, Kopech was as advertised: 11 innings pitched, one walk, nine strikeouts, and one earned run. But everything went sideways in his September 5 start against the Detroit Tigers. Kopech went 3 1/3 innings, allowing nine hits and seven earned runs. And that wasn't even the bad news. The right-hander had a tear in his right UCL, which meant the three words pitchers fear most: Tommy John surgery. The rehab on such a surgery is usually around a year, give or take a few months – everybody is different. The most optimistic timetable would put Kopech back on the mound late in the 2019 season, and if we're going to be optimistic about it, we might as well say that he could arrive in time to help the Sox with a surprise push for the playoffs. Even the optimist has to be a little disheartened by the fact that Kopech arrived in Chicago only for four games before being shut down and having a major elbow surgery. But Tommy John surgery isn't nearly as scary as it once was, and is actually fairly routine these days among young pitchers. For that purpose, let's look at a list of younger pitchers in recent years to undergo the surgery at the age of 25 or younger. Some serve as cautionary tales, but others can provide hope for Kopech's tremendously bright future. ## The Undecided __Max Fried__ __Brady Aiken__ __Walker Buehler__ __Zack Wheeler__ __Jameson Taillon__ For various reasons, there isn't much known about what to expect from this group of TJS survivors. Brady Aiken might be the most interesting case, having been drafted No. 1 overall back in 2014 by the Houston Astros but rejecting their $5 million offer. He had surgery early in 2015, then was drafted No. 17 overall by the Cleveland Indians and signed for $2.5 million. He hasn't pitched above Single-A in his short career, posting a 5.05 ERA in 178 innings and sitting out all of 2018. The rest of this group has made it back to the big leagues since having TJS, but it hasn't been long enough to make a full judgment. Zack Wheeler missed two-and-a-half years recovering from surgery and then was awful in his return in 2017 – he had a 5.21 ERA in 86 1/3 innings. But as a 28-year-old with the Mets in 2018, so far Wheeler has been phenomenal (3.39 ERA in 27 starts). Jameson Taillon was the No. 2 overall pick back in 2010 and was consistently ranked a top-15 prospect in baseball over his first few minor league seasons. But his surgery forced him to miss two full seasons of development, creating doubt about whether Taillon would ever be in the majors. He is, of course, and has been pretty good too. The 26-year-old has a career 3.74 ERA in 401 2/3 innings with 362 strikeouts over three seasons. ## The Bad __Jarrod Parker__ __Matt Moore__ __Darren Dreifort__ __Tyler Chatwood__ There are plenty of examples of pitchers that just couldn't come back strong after Tommy John surgery. Jarrod Parker had the procedure done when he was 20 years old and did make it to the big leagues, pitching well for the Oakland A's until requiring a second surgery. After several years of struggling to make it back, Parker retired. Darren Dreifort was ranked the No. 11 prospect in baseball prior to 1994, and after his surgery he never really panned out as a starter. Matt Moore was a top pitching prospect with the Tampa Bay Rays, and he did live up to his billing. Prior to TJS, Moore posted a 3.53 ERA over 347 innings in the big leagues. Since returning, however, his ERA is 5.25 over 531 1/3 innings pitched. ## The Solid __C.J. Wilson__ __Kerry Wood__ __Jordan Zimmermann__ __Matt Morris__ __Aníbal Sánchez__ Seemingly most common among pitchers to have Tommy John surgery is that they end up with solid-but-unspectacular careers. Kerry Wood is an example of a guy who burst onto the scene at a young age, much like Kopech. Wood struck out 20 batters in his fifth career start as a 20-year-old in 1998, winning the Rookie of the Year award and striking out 233 batters in 166 2/3 innings. Wood missed all of 1999 after having surgery and is remembered most for an injury-plagued career, but he stayed mostly healthy for the few years after his elbow surgery. Through the 2004 season, Wood had a 3.63 ERA with 1,209 strikeouts in 1,043 innings with the Cubs. As his body broke down, he transitioned to the bullpen and became an excellent late inning reliever. Matt Morris is another example of a former top prospect to have Tommy John surgery and turn in a solid career. Prior to the surgery, Morris posted a 2.97 ERA in 50 starts for the St. Louis Cardinals. He briefly went to the bullpen upon returning in 2000, and then for the next seven seasons he averaged right at 200 innings per year with a 4.15 ERA. ## The Great __Stephen Strasburg__ __David Wells__ __Jacob deGrom__ There are few pitchers who have come back from an early Tommy John surgery to achieve greatness. So few, in fact, that David Wells' 1985 surgery is being counted here. Yes, Wells had the procedure back when John was still pitching in the major leagues. At any rate, the left-hander made it to the major leagues with the Toronto Blue Jays in 1987 and went on to have a 21-year career. Wells finished as high as third in the Cy Young voting twice. Strasburg famously had to have the surgery shortly after arriving in the majors in 2010, but he has been exceptional since returning to the mound in 2011. In 191 starts, he has a 3.16 ERA with over 10 K/9 to his credit. If there's anything negative to say about Strasburg, it's that he has remained fairly injury-prone. Mets starter Jacob deGrom had Tommy John surgery in 2010 while he was still in the minors, and it's a big reason why he was already 26 years old when he finally made his big league debut. But deGrom has been one of the very best in the game the last few years, posting a career ERA of 2.69 in 875 2/3 innings. He leads the majors with a 1.71 ERA this year with New York and is the likely Cy Young winner in the National League. ## The Others __Matt Harvey__ __Nathan Eovaldi__ __Jaime García__ __José Fernández__ For various reasons, these guys needed their own category. Matt Harvey bounced back from Tommy John surgery to have a great season in 2015, throwing 189 1/3 innings with a 2.71 ERA and 8.9 K/9. But shoulder problems have derailed his career the last three, and Harvey's ERA has ballooned to 5.39 over 324 innings. Nathan Eovaldi has had elbow surgery twice and has constantly struggled to stay healthy throughout his career, but when he's on the mound he has been solid. Jaime García is another example of a guy who had TJS early in his career and still bounced back, only to later have problems with other injuries. García was a highly-rated pitching prospect with the Cardinals back in 2008 when he had the surgery, and the left-hander returned in 2010 with an excellent rookie season. But he started just 36 games from 2012-2014, and over the last three seasons he has a 4.86 ERA in 403 1/3 innings pitched for six different teams. Probably the most interesting name on this list in regards to Kopech is José Fernández. They have a lot of similarities, in that both were top prospects that relied on high-heat fastballs at the time of their surgery. Fernández came back strong midway through the 2015 season, and through the end of the 2016 season he totaled 40 starts with 247 innings, 332 strikeouts, and a 2.88 ERA. Unfortunately, Fernández also died tragically that September in a boating accident. As with any young pitcher, we have no way of knowing what the future holds for Kopech. Maybe he'll bounce back from Tommy John surgery like Fernández or deGrom, establishing himself as one of the dominating right-handed pitchers in Major League Baseball. Or he could be more like Matt Harvey or Kerry Wood, performing well initially but succumbing to various other injuries later in his career. Sox fans will just have to continue to wait to find out.